We focus on 'Elmer the Elephant' thinking about feelings. 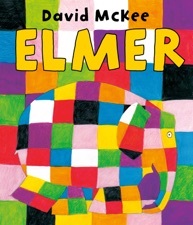 We relate the different colours of Elmer to our own experiences and feelings. We talk about a different feeling each day and relate it to a different colour and come dressed in each day's colour. Everyday we have a circle-time and tell our friends what makes us feel happy, sad, angry, calm and excited. We learn that it is okay to feel all of these emotions and how to ask our friends or grown ups for help if we have sad or angry feelings. All week we play with different coloured malleable materials like, play dough, foam, sand and cornflour. We take part in some yoga and colour in special mandala patterns to help us feel calm. We also make some big patchwork Elmer cushions to use in our book corner to remind us of the different feelings we have been learning about. We draw pictures on a square of fabric with special pens and paints to show the things that make us feel happy. We help Mrs Woods to use a sewing machine to sew all of our patchwork squares together and make an amazing patchwork picnic blanket of all the things that make Nursery happy. On Friday we make colourful cakes and hold an ‘Elmer Picnic Party’ on the field. What a lovely, exciting and happy end to a lovely week full of learning about emotions and being creative.